With the loss of the only specimen remaining in the wild, the Spix Macaw is teetering on the verge of extinction and will be saved only through the heroic efforts of captive macaw breeders. Spix’s Macaws used to be the model of scheduling in the wild, following the same routine day after day. Traveling in pairs or small family groups and often associating with Illiger’s Macaws, the Spix Macaw was often sighted along rivers and in treetops. The Spix Macaw was always extremely shy and was often identified by its raucous call during flight. Wild Spix’s Macaws eat fruit, especially cactus fruit, and green food, nuts, and seeds, especially faveleira and pinhao tree seeds. 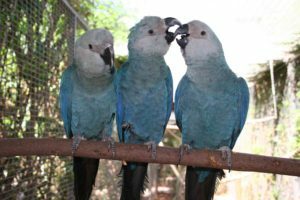 In captivity, Spix’s Macaws should be fed a variety of fruit, green foods, seeds, and nuts, in addition to vitamin and mineral supplements. They may be hand reared on porridge, egg food, and small amounts of pre-cooked beef. An outdoor enclosure with a sheltered, indoor area of about nine by six by six feet is ideal for keeping Spix’s Macaws, but should be made of strong metal mesh to avoid being chewed apart. Spix’s Macaws enjoy quiet and should not be disturbed or stressed very often, as they may become aggressive. If he feels threatened, your Spix’s Macaw will lie on the ground, Apart from becoming easily stressed, Spix’s Macaws are inquisitive, affectionate, playful and surprisingly hardy. They love bathing and chewing and will enjoy all the playtime you can devote to them. Spix’s Macaw is mostly blue, with its back and the upper side of its tail a deep blue shade. The head, forehead, cheeks and ear coverts are grayish with a blue tinge. The breast and abdomen of the Spix Macaw have a tinge of green and the underside of the tail and the wing coverts are both a dull gray in color. The bill is a dark gray to black color, and the feet are dark gray. The iris is yellow, and Spix’s Macaw grows to about 22 inches in length. In captivity they live about 28 years. Native to Brazil, Spix’s Macaw has always been rare. Even in 1819 when Spix discovered this bird, he noted its relatively uncommon occurrence. It lives naturally in the “caatinga”- a scrubby, thorny flat land, along watercourses, and was sometimes seen in open country near palm trees. Due to loss of habitat to introduce Africanized killer bees and for goat grazing, illegal poaching and capture for the pet trade, and relative rarity to begin with this species has been decimated in the wild. In 1990 there was only one remaining Spix Macaw in the wild and it has since died. The reintroduction of a Spix Macaw female into the wild seemed to be effective until she ran into a power line and was killed. 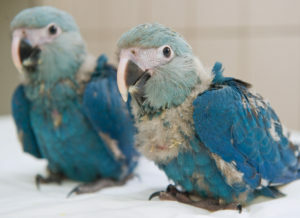 Now, captive breeders have modified their plans and hope that the Spix-Illiger’s pair will raise captive-bred Spix’s Macaw chicks in the wild as their own offspring. Local people who are involved with the Spix Macaw remaining in the wild have incorporated him into local legend; they say he has supernatural abilities, which help him to survive. Today there are about 60 Spix’s Macaws in captivity, 54 of these having been captive bred. In a 1990 effort to produce more captive breeding pairs for the wild-reintroduction program, the Brazilian government granted amnesty to illegal Spix Macaw holders. No one came forward as hoped and the world Spix’s Macaws population remains incredibly small and precarious. 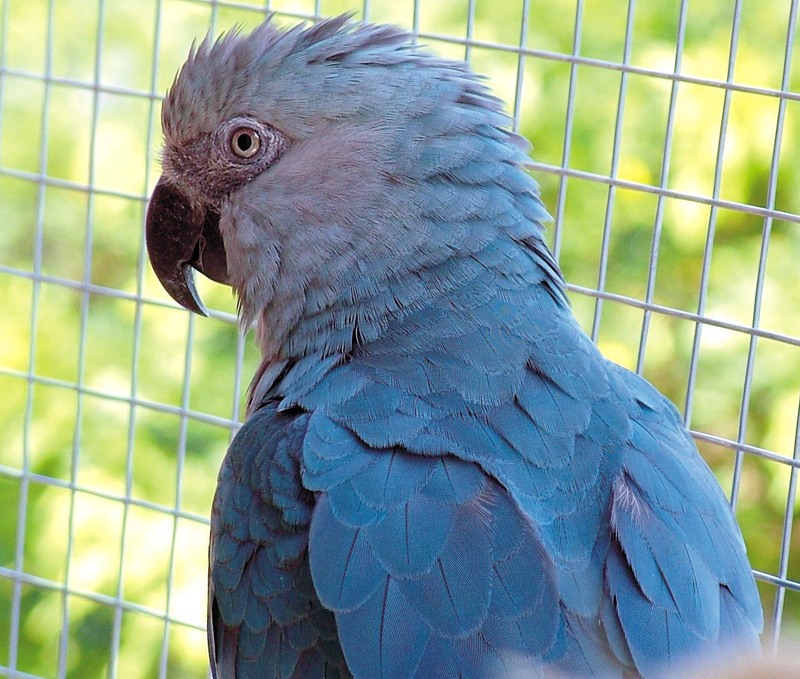 The small captive number are all closely related, however, it has been reported that a Spix’s Macaw that was kept as a pet was turned over to Brazil for breeding – and this individual is not closely related to the others in the breeding program. If this parrot will breed it will help to diversify the gene pool. Official breeding programs have requested that individuals who have these birds donate them to the progams in order to increase populations. In captivity, Spix’s Macaws should be fed a variety of fruit, green foods, seeds, and nuts, in addition to vitamin and mineral supplements. They may be hand reared on porridge, egg food, and small amounts of pre-cooked beef. An outdoor enclosure with a sheltered, indoor area of about nine by six by six feet is ideal for keeping Spix’s Macaws, but should be made of strong metal mesh to avoid being chewed apart! Spix’s Macaws enjoy quiet and should not be disturbed or stressed very often, as they may become aggressive. 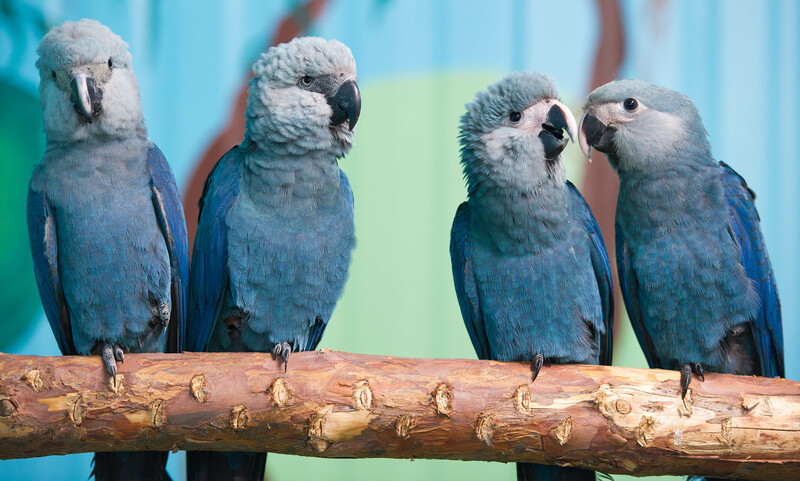 Spix’s Macaw should not be kept in temperatures below 68 degrees Fahrenheit. Its enclosure should include a hollow tree stump 14 inches in diameter and at least 28 inches high with a ten-inch entrance hole so that your Spix Macaw has a hiding place, should he feel stressed. In the wild, Spix’s Macaws breed between November and March. Two to three eggs were laid in tree hollows, and the same nests were reused each year. Hatchlings fledge for about two months and remain with their parents for three more before leaving the nest. Immature Spix’s Macaws have shorter tails than adults, with brown irises and a horn-colored upper mandible edged with the blackish coloration it will acquire with maturity.